* 7pm: RBG @ The Music Hall Loft — More showtimes have been added for this incredible film about Justice Ruth Bader Ginsberg, due to high demand. Rotten Tomatoes has just ranked it *#1* of 2018 Summer Movie Scorecard! It also managed to make Top 10 specialty box office for last week, despite being in only 180 theaters. Anyway — go see it! * 8pm: Button Factory Jazz — Paul Heckel / Paul Hunter duo @ WSCA’s Button Factory stage — Your weekly dose of Jazz, man! * 7pm: Wonder Tales @ NH Theatre Project — NHTP’s Youth Repertory Company presents a collection of stories, legends and tales of wonder from around the world adapted by Genevieve Aichele. See clever girls outwit the powers that be, take a journey into the frozen future and explore the powers of attraction! * 7pm: RBG @ The Music Hall Loft — Don’t miss this incredible look at Justice Ruth Bader Ginsberg. 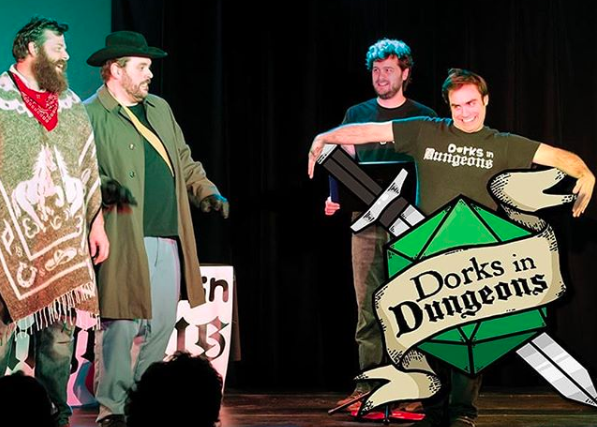 * 8pm: Dorks in Dungeons — This improv show is packed with incredibly talented local actors and comedians, and is guaranteed to be a great time. It’s $12 in advance, and pay what you can at the door — while seats last! * 10am: Commissioning of the USS Manchester @ NH State Pier — Over 5,000 are expected to be in attendance — if you don’t have a ticket, you can watch online. * 12–4pm: Joseph Ribkoff Flash Event @ Club Boutique City Shoes — A sale & an event! Get 10% off all in-store Joseph Ribkoff dresses, tops, pants and jumpsuits, and get a sneak peek at the fabulous fall line. Try on anything Joseph Ribkoff and enter to win a $50 gift card to Club Boutique! * 5–7pm: 2018 exhibition season opening reception @ George Marshall Gallery — See new works from Sarah Haskell, Bill Cass, Lynn Duryea, Catherine Kernan and Larry Hayden — I’m excited to see Sarah Haskell’s community art piece, “Well Used, Well Loved” at this gorgeous seaside York gallery. * 8pm: Bunny & the Fox Country Hoedown @ 3S Artspace — Portsmouth’s own drag host Bunny Wonderland and Ru Paul’s Drag Race alum Jocelyn Fox return to kick off a 3-month extension of their underground hit show! * 2pm: Wonder Tales @ NH Theatre Project — NHTP’s Youth Repertory Company presents a collection of stories, legends and tales of wonder from around the world adapted by Genevieve Aichele. See clever girls outwit the powers that be, take a journey into the frozen future and explore the powers of attraction! * 8pm: Halfway to Halloween movie night @ PPMtv — “Meet me at the Meetinghouse” for some scary movies! * Monday 5/28 John Paul Jones House museum & garden open for the 2018 season! * Tuesday 5/29 7pm: the 24th Annual Spotlight on the Arts Awards @ the Seacoast Rep — See who takes home awards the Seacoast’s best in music, theater and the culinary arts during the year 2017. Proceeds benefit Gather. * Tuesday 5/29 7pm: RBG @ The Music Hall Loft — Last chance to see this Rotten Tomatoes #1 and specialty box office Top 10 doc! This events lineup originally appeared in the 5/24/18 issue of The PortsmouthLOVE Letter, which hits inboxes every Thursday with news, notes and neat events from the Portsmouth, NH area. Plus puppies.